I'm a huge James Bond fan. So much that one of my earliest online identities way back in the 90's was NextBondGirl. I begged my OB to let me off bedrest so i could see Tomorrow Never Dies on opening day. yes i'm THAT kind of fan. It took a lot of time for me to warm up to Daniel Craig and at this point i kinda love him now. Skyfall opens strong and never lets you down. it goes back to vintage Bond, with the usual opening fight and/or escape scene except this time Bond gets shot and is presumed dead. The opening sequence is the kind i've seen back from the Shirley Bassey golden years. A killer theme song by Adele and a montage of blood, drownings, graveyard, naked girls with guns... everything you're supposed to see in a Bond opening sequence. Switch to the not dead James Bond driving with locals and screwing the sexiest girl he can find. Skyfall is not really about James, well it is and it's not. The villain here is someone from M's past. Javier Bardem plays Silva, a former operative under M's service many years ago who wants to kill her but first torments and publicly shaming her. His plan was years in the making and he plays this part oh so well. When James becomes aware that M's a target he goes and does what any good son would do and comes back from enjoying his life as a dead man to protect her. There's so many references to James being too old to do what he's doing which admittedly would have been more convincing with Sean Connery was doing some of the later films especially Diamonds Are Forever. While Bond gets a new Q in this film (Ben Whishaw) a young computer geek with a fear of flying. He and James clearly don't see eye to eye and instead of the gadgets of yesteryear, there's even a reference the the exploding pen in GoldenEye. This movie takes you to some visually stunning locations, Shanghai looks great. The things this films does right, Bond beds more than 1 woman, the opening and theme, Judi Dench as a stellar m who's worried when she needs to be and callous as expected. She may be a woman but she's hard as rails when they try to force her into retirement, James beds Moneypenny (off-screen), an Ashon Martin complete with ejector seat and guns behind the headlights from a previous film. A villain who's just slimey enough you want him to die but not before you get to enjoy him just a tad longer. The film setup did drag a bit in the film round-up. The movie has a huge climatic ending that takes play in Scotland and it clears up some of the ambiguous details of Bond's private life. We also get a new M before the movie end, in an office that should look familiar to fans. I still loved this film and it goes into my Top 5 favorite Bond films ever. 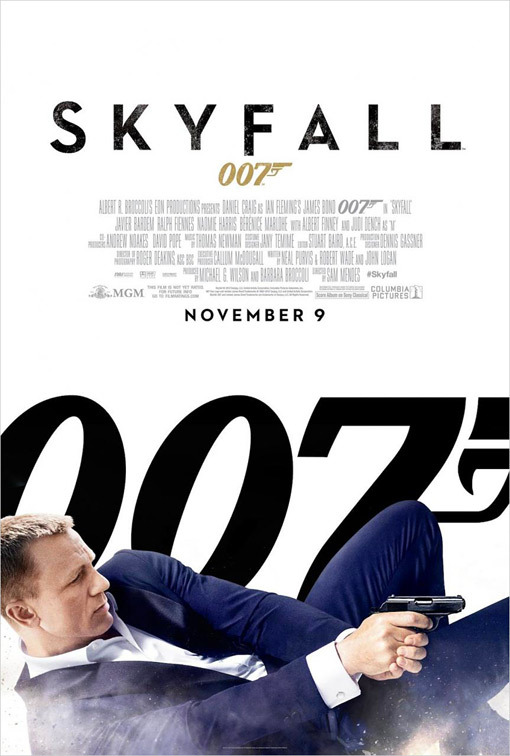 The references to the earlier films and the way Craig plays Bond. he's not the smooth slick Bond Pierce Bronsan or Roger Moore gave us, he's much more rugged and it makes him sexier in a different way. I give this movie a full price. I had the pleasure of screening this film in IMAX and while its not shot in IMAX the sound quality and the way it looks on the large screen was totally worth it to me. The rumbling of my seat during the helicopter scenes, the very vivid explosions, I loved it.